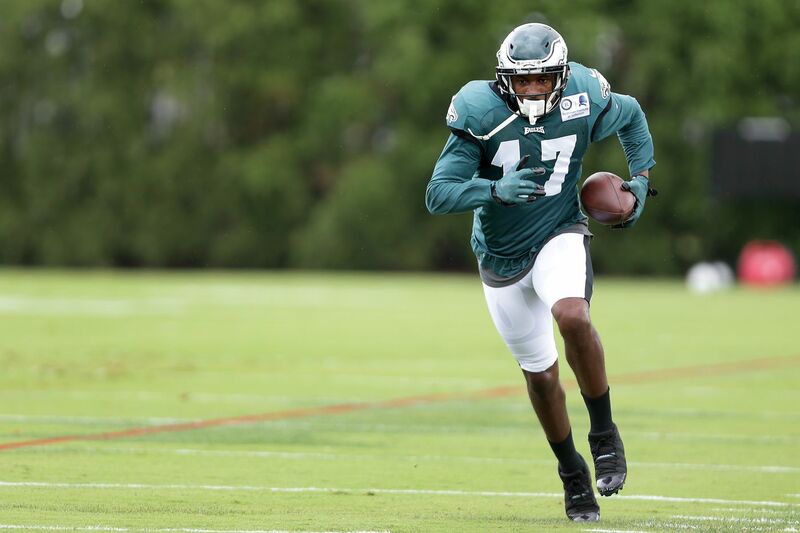 Alshon Jeffery participated in the individual portion of practice on Wednesday, a notable sign of progress for the injured wide receiver. Jeffery has not participated in practice since the Super Bowl. He underwent rotator-cuff surgery during the offseason. Jeffery is not ready to take part in 11-on-11 drills, so he was limited at practice. He is unlikely to play on Sunday against Tampa Bay, but he's trending in the right direction. The Eagles continued to tinker with their wide-receiver depth chart. They added Kamar Aiken on Wednesday morning and released Markus Wheaton, swapping a pair of veterans they had in training camp and the preseason. They made the move even though they signed Wheaton last week and guaranteed his salary for the season. He played only three offensive snaps. Aiken, who missed two preseason games with a hamstring injury, has 27 career starts since entering the NFL in 2011. His best season was in 2015, when he had 75 catches for 944 yards and five touchdowns with the Baltimore Ravens. "Kamar gives us depth. He gives us experience," Pederson said. "He gives us some special-teams availability. It's a good fit. Then, some of the other young players that we do work out, if they can transition on to [the] practice squad." Aiken thought there was a chance to return to the Eagles. He said he "wasn't quite there, confidence-wise" with his hamstring to play Week 1. He'll play special teams and can contribute as a perimeter blocker on offense, in addition to his receiving abilities. Mike Wallace's first regular-season game with the Eagles came and went without a reception. The starting receiver, who played 92 percent of the offensive snaps, was targeted three times. Wallace is expected to be the Eagles' deep threat, but he hasn't been able to connect with Nick Foles. Pederson said he was not concerned. "No, because last week, we get into game plan-specific things," Pederson said. "And Atlanta's defense, we had some shots in there for Mike, and give credit again" to the Falcons. "We got the coverage. They just defended it. We had to go somewhere else with the football. So, each week is a little bit different. We try to get Mike involved. We try to get our tight ends involved, obviously Nelson [Agholor]. It's my job to make sure I call the plays that go to specific players throughout the game and make sure we're spreading the ball around. Mike is such a team player, too, that that doesn't bother him." Foles said the two are "really close" to making a connection, and the Eagles "need to get the ball in his hands." In addition to Jeffery, quarterback Carson Wentz (knee), running back Darren Sproles (hamstring), and wide receiver Shelton Gibson (knee) were limited at practice. Nobody missed practice. … Four starters on the Buccaneers missed practice, including wide receiver DeSean Jackson (shoulder/concussion) and defensive end Jason Pierre-Paul (knee). Staff writer Les Bowen contributed to this report.